Exhibition catalogue, Ben Nicholson Drawings, London, Marlborough Fine Art, June - July 1970, p. 12, no. 4, illustrated. 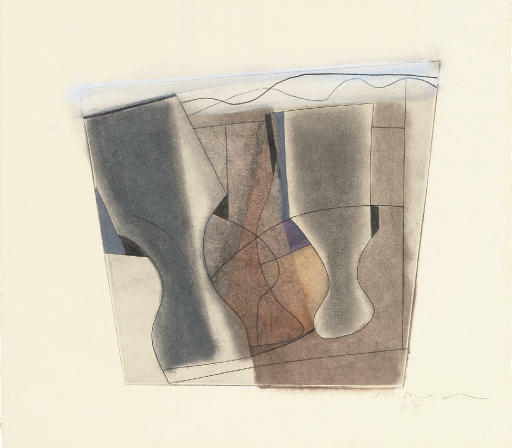 London, Marlborough Fine Art, Ben Nicholson Drawings, June - July 1970, no. 4. The present work, dating from 1968 (and then subsequently dated 1969 by the artist) forms part of Nicholson's fascination with printing in the late 1960s. Nicholson had previously adopted drypoint as a method, however, between 1965 and 1968 he worked with François Lafranca, a Swiss printer, in making a series of etchings which aligned closely with the artist's linear drawing technique. In October 1968 Nicholson wrote, 'I think I am not an "etcher" as I understand the medium at all. ... I suppose [my etchings] are really drawings on prepared copper (and I like very much the clear line and the resistancy of the material and the smooth run of the implement)' (see letter from Ben Nicholson to Maurice de Sausmarez, published in Studio special 1969, p. 59). In a previous letter to de Sausmarez, Nicholson wrote, 'I'm glad you liked the etching ... the bite of the steel point into the metal is a terrific experience when all goes right and the necessity I am finding to reduce the idea to a series of lines is interesting. There is a point also where I can cut into the metal in a line as straight as any ruler but with this difference, that the ruler will always rule straight whereas my hand line may at any moment decide to develop a curve - (it may decide) and if it does so then other lines must relate and may even develop a bigger curve or even straighter line than either I or the ruler themselves could make' (see op. cit, p. 58). As in the present work, often the copper printing plates would not be true rectangles, rather they would be shaped, echoing Nicholson's fascination with tension and balance within form. On occasions, such as in the present work, an oil wash would be applied to create a unique work, or sometimes (perhaps in the case of a rejected pull), the sheet would be turned over, then worked on, giving Nicholson a relief surface to work with. Nicholson referred to these unique graphic works as 'mixed media' (see N. Lynton, Ben Nicholson, London, 1998, p. 184).